Our students are the heart of Stormonth. From K4-4th grade, there are many opportunities at each grade level both educationally and socially for our students to learn, grow, and have fun. From educational field trips, assemblies, school musical, talent shows, and service opportunities to learn from helping others, students are engaged wide variety of learning experiences at Stormonth Elementary. Our PTO also organizes many community events throughout the school year for our students and their families. Click to view the video documenting this incredible, collaborative process of creating the new Stormonth Mural. 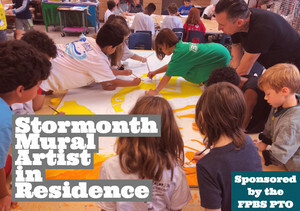 Through the PTO sponsored Artist in Residence program this year, a local artist James Tomasello, worked with all of our students in painting a mural that highlights Stormonth School. The mural represents community, uniqueness, academics and the arts. This amazing mural is located in the entryway of Stormonth. We can not thank the PTO enough for providing the funds which gave our students such a wonderful opportunity to paint such a special mural. We love our school and all that it offers to our students and families.